MARINUS THE TYRIAN; HIS OIKOUMENE OF 225 DEGREES LONGITUDE: GEOGRAPHIKE HYPHEGESIS; BOOK 1, CHAPTERS 11 & 12, PTOLEMY. ” We will now add, from the distances which Marinus gives, the other degrees on the same parallel”. It would therefore appear that Marinus did not quote actual geographical positions wholly by latitude and longitude, a point complained of by Ptolemy, but, generally by distance measure. Thus it is necessary to reconvert the coordinates given by Ptolemy to distances and thus establish the actual world of Marinus. GEOGRAPHIKE HYPHEGESIS, BOOK 1, CHAPTER 11, CLAUDIUS PTOLEMY. TITLE, The errors of Marinus in calculating the longitude of the habitable earth, (or in another translation) On the computations that Marinus improperly made for the longitudinal dimension of the oikoumene. 1) Marinus gives us the longitude, between two meridians enclosing a total space of fifteen hours. 2) The distance from the Fortunate Islands to the Euphrates at Hieropolis, which we place with Marinus on the parallel passing through Rhodes, must be reckoned according to the number of Stadia determined by Marinus. 3) Marinus also makes one degree of the three hundred and sixty which the largest circle contains, measure 500 stadia on the surface of the earth, a measurement which is proved by distances that are known and certain. 4) Likewise the circle which passes through Rhodes, Marinus shows to be 36 degrees distant from the Equator, and each degree to measure approximately 400 stadia, and the excess of the number (according to an exact reckoning of the location of the parallels), in some measure counter-balances the defect in the others, and is negligible in the whole computation. 5) The distance from the Euphrates at Hieropolis to the Stone Tower, Marinus gives as 876 Schena, or 26280 stadia. The distance from the Stone Tower to Sera, “the Capital of the Seres”, which is a journey of 7 months, he computes at 36200 stadia. 6) The journey from the Stone Tower to Sera was exposed to winter tempests, for it lies, according to Marinus himself on the parallel that passes through Byzantium and the Hellespont. NOTE; Here I must enter a cautionary note apropos the place name Sera and whether it is always intended to be the capital of the silk country, China, or the capital of Serica to the north. A complete explanation of that fact is given in the following text, Mt2. I have tabulated 20 instances of the name. GEOGRAPHIKE HYPHEGESIS, BOOK 1, CHAPTER 12, CLAUDIUS PTOLEMY ENTITLED,” The calculation of longitude corrected by land journeys”. The text is quoted verbatim for continuity and includes comments by Ptolemy. Some have been italicised in order that the words of Marinus are foremost, and information required easily distinguished. “For these reasons therefore, and because the journey is not on one and the same parallel, for the Stone Tower is on the parallel that passes through Byzantium, and Sera is more to the south and on the parallel that passes through the Hellespont, it seems to us proper that the number of stadia, viz., 36200, which was computed from a journey of 7 months, should be cut down to not less than one-half; so that the distance in stadia may be computed as 18100, or 451/4 degrees. It would be inept and absurd should anyone follow on both journeys, that is, on this journey and on the journey from the Garamantes, reasoning which led to this conclusion, for the reason was based upon the difference noted in the animals which inhabit the region of Agisymba, animals which cannot be transferred to localities outside the limits of those assigned to them by nature. The reason does not hold likewise in reckoning the distance of the Stone Tower from Sera, for throughout the whole distance, be the intervals great or small, there is the same temperate climate. It is much the same as though a man, who could be convicted never-the-less, according to the rightful precepts of philosophy. Wherefore the former distance which Marinus gave from the Euphrates to the Stone Tower viz., 876 Schena; must be reduced because of deviations on the journey, to only 800 Schena or 24000 stadia; and this is verified by particular measurements taken on that journey, and by the frequent visits made to those places on that journey (note this is a 10% reduction only and hardly counts as an adjustment when they are normally in the region of 50%.). That the journey had deviations is clear from statements made by Marinus himself, for in making the journey from the ford over the Euphrates at Hieropolis through Mesopotamia to the Tigris, and through the Garamantes of Assyria and the Media to Ecbatana and the Caspian Gates, and from there through Parthia to Hechatompilum, the right course is to follow the parallel of Rhodes, as this parallel passes through those regions. To proceed from Hechatompilum to the city of Hyrcania it is necessary to deviate north. The city Hyrcania lies about midway between the Smyrna and the Hellespont parallels, the parallel of Smyrna is also called the Parallel of Hyrcania, but the parallel of the Hellespont passes through the southern shores of the Hyrcanian sea, which are situated somewhat to the north of the city of Hyrcania which takes its name from that sea. The journey thence to Antiocha Margiana through Asia, first turns to the south (since Asia is on the same parallel as the Caspian gates), and then turns to the north, since Antioch is close to the Hellespont parallel. From Antioch to Bactria the journey deviates to the east, and after ascending the Comedon Mountains it bends to the north. From the mountains, where it comes to the plain at their base, it inclines to the south, for the mountains extend north and east. The ascent is placed by Marinus on the Byzantium parallel, and the southern and eastern ranges are located on the Hellespont parallel. The mountains themselves he places to the east, but plainly extends them so as partially to decline to the south. Likewise he says that the journey for 50 Schena before coming to the Stone Tower deviates to the north. When you have traversed the plain, at the base of the mountains you arrive at the Stone Tower, and from there you come to the mountains which run in an easterly direction, ending in Imao which is north of Palimbothris. Adding the degrees which have been noted, they amount to 60 or 24000 stadia. When we have added the 451/4 degrees from the Stone Tower to Sera, the total distance from the Euphrates to Sera on the parallel of Rhodes will amount to 1050 15’. We will now add, from the distances which Marinus gives, the other degrees on the same parallel, and first of all from the meridian passing through the Fortunate Islands, as far as the sacred Promontory of Spain 20 30’, thence to the mouth of the river Baetis, and from the Baetis to the Strait and to Calpe is likewise 20 30’, being one and the same distance; from the Strait to Caralis, a city in Sardinia, is 250; from Caralis to the promontory of Lilybaeum in Sicily 40 30’; from Lilybaeum to Pachynus is 30; from Pachynus to Taenarus in Laconia is 100; thence to Rhodes is 80 15’; from Rhodes to Issus is 110 15’; from Issus to the Euphrates is 20 30’; the sum of all these degrees is 720. Hence, the length of the known earth, that is, from the meridian drawn through or terminated by the Fortunate Islands in the extreme west, to Sera in the extreme east is 1770 15’.” End Quote. 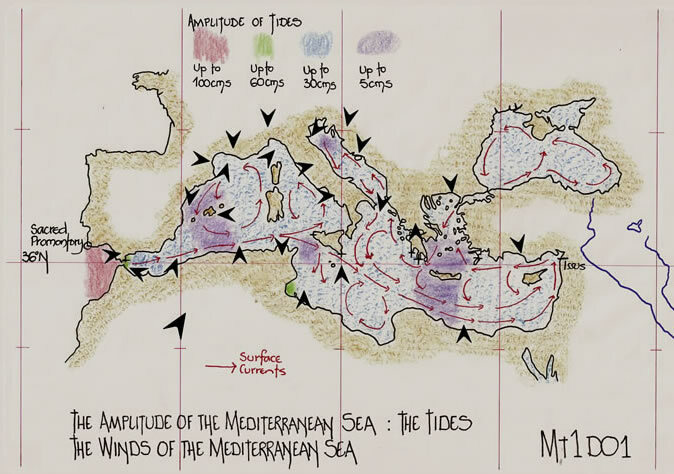 The foregoing text illustrates that Marinus the Tyrian certainly used parallels or latitudes on his maps, but is contradictory regarding the use of meridians. That they were drawn is evidenced by the text, but their actual positioning is perhaps not as regular as the single hour or 150 subdivisions which are discussed. Therefore it is possible that the latitudes and longitudes denoted by Claudius Ptolemy were probably drawn onto the maps of Marinus so that they can be read systematically. This would allow for a duly amended map of Marinus to be redrawn to Ptolemy’s wishes. But, if Marinus quoted no longitudinal degrees and used only distance measures, then it is incumbent upon researchers to ignore those units and concentrate upon the actual distance measures to evaluate the maps of Marinus..
As Claudius Ptolemy has interpolated the degrees from the distance measures of Marinus we must start our analysis by reconverting the degrees to Stadia. Each measure in Stadia is perhaps not the exact figure of Marinus. We do not know how sanitized the degrees of Ptolemy are particularly as he has a penchant for regularity and symmetry. However, with figures such as 80 15’ and 110 15,’ perhaps we can assume an accuracy. As has been indicated in text Cp2 and diagrams Cp2D01, Cp2D02, Cp2D03 and Cp2D04, this route across the length of the Mediterranean Sea is not along the geographical 36th parallel, but is an itinerary measure made upon a route well known to the sailors of the age. That Marinus the Tyrian had these geographical positions on the 36th parallel is not in doubt. This text, Mt1, is to establish the oikoumene of Marinus and only indicates the information required to establish that fact. A follow up text Mt2 will discuss the actual map(s) and establish a possibility. I have already intimated that Marinus the Tyrian utilized the methodology of Eratosthenes of Cyrene, by using purely itinerary measures to determine the length of the oikoumene. 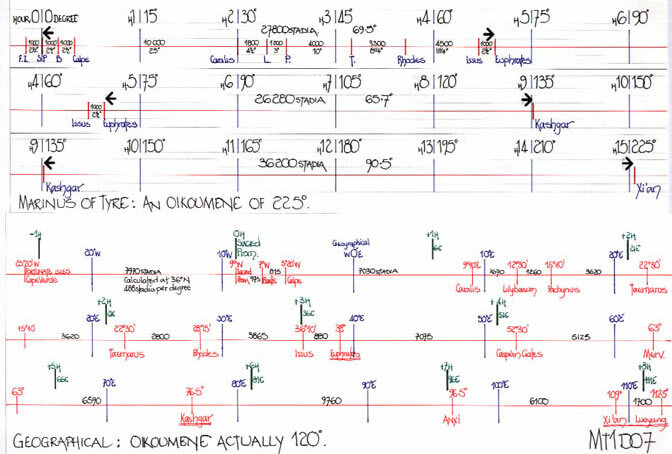 I am reproducing from Text Es1 diagrams which indicate how Eratosthenes measured his oikoumene. They are Es1D01, Es1D02, Es1D03 and Es1D04, which indicate the itinerary measures from the Capes of Iberia to the Capes of India. Es1D04 has the measurements from the River Nile via the Euphrates to the Caspian gates. 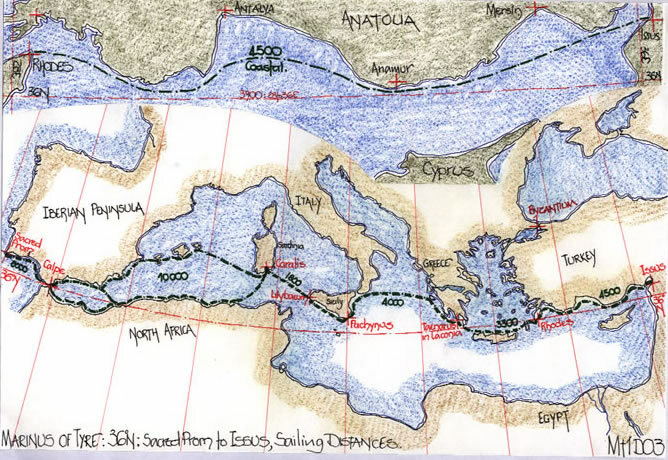 After this point Eratosthenes chooses a southerly route for his measurements via India, whereas Marinus chooses the northern caravan route. This of course indicates that the caravan routes in the era of Eratosthenes were not fully explored and thus probably had no major part to play in the geographical knowledge of his time. 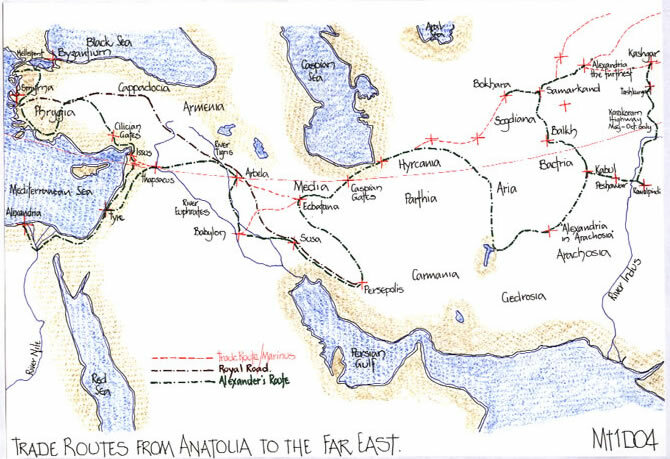 Alexander the Greats journey and the Royal Roads of Persia being exceptions. Further exploration of this point is made later when discussing the first substantial Chinese Kingdom that was formed and became a trading nation, exploiting the Roman desire for Silk. This however is some 100 years after Eratosthenes and is probably why his oikoumene is limited to the Capes of India. Sailing in the Mediterranean Sea is hardly affected by the tidal amplitude which is on average 30 to 40 centimetres. The lowest rise is in fact around the Balearic Islands, the Malta strait and the Greek islands from the north of Crete to the Egyptian coast. The winds however are a very different matter and can affect the sailing routes. In ancient times those routes tended to be coastal cruises, mostly anchoring at night. The same can be said of the natural currents that are generated from the flow through the Pillars of Hercules which obviously affected the sailing routes. Therefore we can glean from the data attributable to Marinus from within Ptolemy’s text that, if they are sailing routes, then they would be reasonably close to the available mainland and islands. Having converted the degrees given by Ptolemy back to stadia using the 400 stadia per degree at 360N we can draw the putative routes upon a geographical map of the Mediterranean Sea and ascertain the veracity of the measures. Commencing at the Sacred Promontory of Iberia, the first distance of 1000 stadia immediately produces a conundrum. Did Marinus refer to Baetica and not the Baetis River as noted by Ptolemy? The distance measure is quite perfect for the mouth of the Odiel and Tinto Rivers at Onoba/Huelva. It is also well positioned for the next distance measure to Calpe, the same 1000 stadia. The fact that the Baetis River has always been thought of as the Guadalquivir River further along the coast towards Gades may have led to this confusion. The next tranche of the measures is from Calpe to Caralis in Sardinia, some 10000 stadia. There are three possible routes, all nearly the same distance and capable of being used given the adverse wind direction which is prevalent for part of the year. However, it is a sailing distance that Marinus has used and it should also be noted that Marinus has placed Caralis on the 2nd hour line or 300 from the Sacred Promontory of Iberia. From Caralis to Lilybaeum Promontory, the western tip of Sicily, the distance matches the 1800 stadia of Marinus. From Lilybaeum to Pachynus Promontory along the south coast of Sicily it is in fact 1400 stadia. That is 200 stadia more than the distance given by Marinus of 1200 Stadia. This is hardly an error worth noting. From Pachynus to Taenarus in Laconia Marinus states as 4000 stadia. The direct distance is 3600 stadia, but to sail that route requires a northwards deviation hugging the land to afford the minimal open sea crossing between Italy and Greece. Thus again it is a sailing distance and quite accurate. From Taenarus to Rhodes it is 3300 stadia, with a route via the north coast of Crete, and then island hopping north to Rhodes. It is the sailing distance and quite accurate. 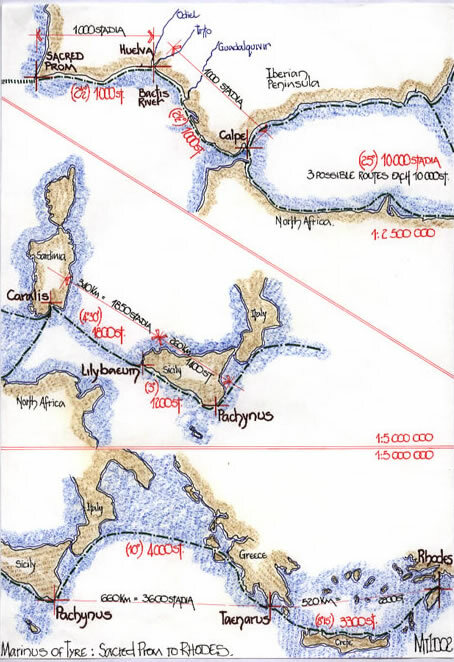 The last sailing distance, from Rhodes to Issus, is along the southern shoreline of Anatolia, basically following the 360N latitude and is as Marinus stated 4500 stadia. The methodology of Marinus is akin to that of Eratosthenes, using known itinerary distances and then plotting them on the Latitude which just happens to be 360N. This has a simple stadia measure of 400 when compared to the equatorial measure of 500 stadia. Unfortunately the 360N latitude does not fairly represent the route measure chosen by Marinus and thus distortions in the map must have appeared. I have deliberately ignored the 1000 stadia from the Fortunate Islands to the Sacred Promontory of Iberia as I believe it has no basis in fact and can only be likened to the extra 2000 stadia which Eratosthenes added to his oikoumene in order to have a balanced ratio of length to width as text Es1 indicates. This point is adequately confirmed later in the research. The following two measures given by Marinus, to and from the Stone Tower can now be appraised in a similar manner. There is controversy over the exact location of the Stone Tower. It is thought to be on the borders of China where Tajikistan, Afghanistan, Pakistan and China meet near the Khunjerab Pass to the west of the mountain now known as K2. Research has indicated that it may be the town of Tashkurgan in Xinjiang province of China, just south of Kashgar. Tashkurgan translates as Stone Fortress or Stone Tower from the Uyghur language, but there are now several towns with a similar translation of the name. I have chosen to use Kashgar as a plausible Stone Tower for the following calculations. The contenders are placed so close as to negate any considerable change in the calculations. This also avoids being embroiled in any controversy! Hieropolis/ Mesopotamia to the Tigris/ Ecbatana/ Caspian Gates/ Hechatompilum/ Hyrcania City/ Antioch Margiana/ Comedon Mountains/ and then 50 Schena to the Stone Tower. This route is none other than one of the ancient trade routes of Asia. It was partially used by Alexander the Great in his campaign to conquer the East, and has been known as ‘The Silk Road’ since 1877 when the German geographer Ferdinand von Richthofen so named it. This section of the trade route is well known and documented and comprises a route to and from Kashgar on the border of China. It has been travelled for centuries and the distance quoted by Marinus is in fact quite reasonable. It can easily be measured on large scale maps, and the distance can be assessed in by two methods. From Heiropolis to Kashgar on the 36th parallel it is 380 longitude or 18600 stadia. By using one of the well known caravan routes, basically as described in the text it is c22000 stadia, which is c80% of the original measure, 26280 stadia. 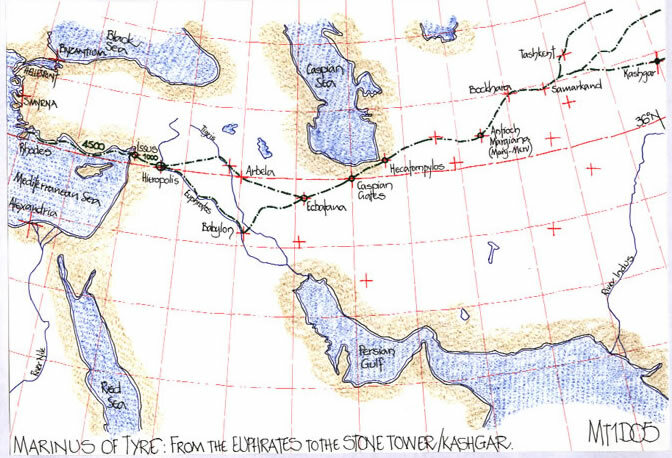 However the distance measure given by Marinus does determine that Kashgar, which I have decided to use as the most likely place evaluate as the Stone Tower, is situated upon the 9th hour line at 1350 from the Sacred Promontory of Iberia. It is also apparent from the diagram that there is a four degree shift to the north, just as Marinus predicts with his Byzantium parallel equivalent, and is as described by Ptolemy. Ptolemy reduces the route length to 800 Schena or 24000 stadia, and thus the possible actual distance becomes c90% of that total. This is a minor alteration and of no consequence. These distances, derived from days spent on the march have been converted to measurements. As we do not know the actual route it is impractical to speculate further. Needless to say though, it is quite accurate in the circumstances. The distance quoted by Marinus presents to us a further conundrum. He gives a journey time of 7 months, and computes it as 36200 stadia. Not least, it is some 6660 kilometres, and in fact 90.50 or 89.60 degrees of longitude calculated at 400 or 404 stadia per degree at 360N. I find it hard to reconcile a measurement of 900, the quarter of the Earth, not being recognised Ptolemy and commented upon. It is a very significant measurement and one he was aware of. Mathematically, we have the following figures; 36200÷ 90 = 402.22 stadia, which is the latitude measure for 36.440N. That equates to 92.5/115 or 37/46. Ptolemy uses 93/115 = 0.8086956 and is 36.030N. But 92/115 = 0.8 and is 36.870N. Was the minor discrepancy of the measure at 360N, 2.22 or 4.5 stadia? The next conundrum to solve is 7 months travel equalling 36200 stadia. That is an average over the 210 days of 172 stadia per day or 14.365 stadia per hour over 12 hours. That is 2.64 Km per hour. However, if a journey time of 7 months is given Camel Trains require halts not only for food and water, but also for rest periods after any arduous travels. Inclement weather would also mean an enforced halt. But, a camel train is only as fast as the human drovers can walk, and that has been shown to be from 2 to 4 Km per hour. The original calculation was in all probability correct but it made no allowance for rest stops or enforced stops. Before the research can continue it is necessary to establish what was happening in China prior to the era of Marinus and Ptolemy. And, before completing the analysis of the travel distances it is necessary to establish the capital of the Seres as may have been known by Marinus and Ptolemy. The epoch of the warring states in China was from 403 to 221 BCE and in 221BCE Cheng the ruler of Ch’in annexed the remaining six states including Han. This first Ch’in dynasty reformed the measures by standardizing weights, measures, coins and script, and, The Great Wall was built consisting mainly of earthen mounds. From 206BCE to 9CE the Western Han Dynasty ruled and under the Emperor Wu Ti the transcontinental trade flourished on the yet to be named “Silk Roads”. In around 139BCE a Han diplomat travelled as far as the eastern conquest lands of Alexander the Great, and afterwards envoys were sent and lucrative trade caravans established. It was also noted that Chinese Silk was a large export. A Roman manufactured glass was found at Canton, dated to the 1st century BCE and probably came from the maritime route passing through the South China Sea. Chinese Silk was popular attire in Rome by the time of Julius Caesar (100-44BCE). From 25-250CE the Eastern Han Dynasty carried out international trade, initiated from Nan-Hai, or as we know it Canton. In the text Cp3, I indicate that Cattigara Sina is none other than Canton and its roadstead of Whampoa, just as Marinus/Ptolemy describes. By the end of the first century CE China had invented paper, Turkestan was conquered and the Persian Gulf reached. Thus we can speculate upon the transfer of knowledge via both the “Silk Roads” and the maritime trade routes across the South China Sea via India to the Near East. Both Marinus and Ptolemy are writing in the periods which would have had adequate knowledge of this trade. The capital cities of China which could therefore have been known to them must have been ones which held sway over enough of China and allowed outside contact. However I would caution all when reading the text of Ptolemy as the name of the capital varies until we finally read that it is Thine Metropolis in the listings. This name appears out of nowhere and as text Mt2 will illustrate it is perhaps to cover a large manipulation of the text by Marinus. The caravan routes are many, well defined, well travelled and well documented. 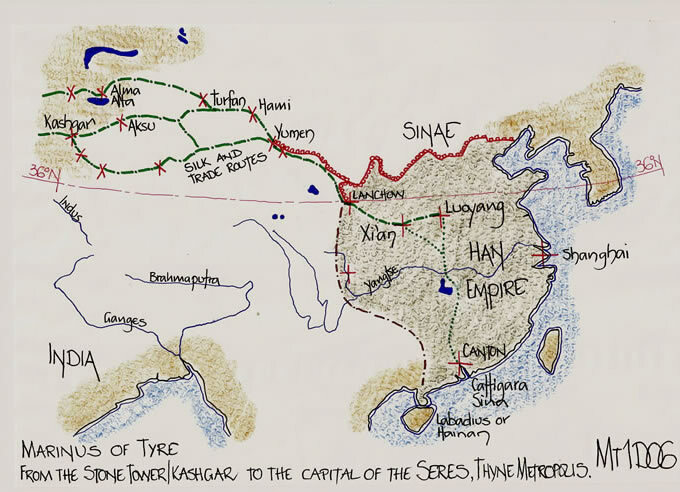 From Luoyang and or Xi’an, the trail is to Anxi where it bifurcates and proceeds via three distinct routes, two via Kashgar and the other via Kokend, before they all meet again prior to arriving at Merv/Mary/Antioch Margiana in Bactria. The distance from Luoyang/Xi’an to Kashgar is c21000 stadia, as an average. If we recalculate the time of travel for that distance at 150 stadia per day, it equates to 140 days travel. That is probably a plausible answer to the actual travel time as it equates to 2/3rds of the 7 months or 210 days that is stated by Marinus. The caravans cannot proceed without stopping for rest periods with 210 days total travel. The Camels must rest as must the drovers and there would have been waiting time for other caravans to arrive for the exchange of goods. This is 10 months actual travelling without allowance for halts etc., and would probably mean an overall journey (if it was ever carried out by one person) of some 15 months. By not calculating the travel times given as requiring stoppage days, Marinus has extended the distances by 25% and 33%. THE OIKOUMENE OF MARINUS THE TYRIAN RECALCULATED. We are informed by Ptolemy that Marinus gave the longitude, between two meridians enclosing a total space of 15 hours. However, we are not informed what those two meridians actually delineate. It is Ptolemy who determines the distance, 12 hours or 1800 degrees of longitude from the Fortunate Islands to Sina and Cattigara. Ptolemy appears to indicate that Marinus gave a distance from the Fortunate Islands to the Sacred Promontory of Iberia on the 36th parallel, but is that in fact correct? If we accept the 720 from the Fortunate Islands to the Euphrates, and add the two other distances that Marinus gives of 876 Schena and 36200 stadia, calculated at 360N, we have 72+65.7+90.5=228.2 degrees. Calculated at 404 stadia per degree it is 72+ 60.05+89.6=226.65 degrees at 360N. The 15 hours is 225 degrees and an average of the above would give 227.5 degrees (i.e. 402 stadia) and hence it is possible to opine that the Oikoumene of Marinus the Tyrian, between the two meridians, was from the Sacred Promontory to the Capital of the Seres, and did not include the Fortunate Islands. Geographically that is 90W to 1090E for Xi’an or 112.50E for Luoyang, and a rather neat 8 hours or 1200 degrees. I therefore opine that the 1000 stadia (2.50) west of the Sacred Promontory is none other than an additional measure given by Marinus, precisely as does Eratosthenes with his 2000 stadia measure (Es1), and was never a maritime or travel distance as each of the other distances have been shown to represent. Thus the longitude of the Cape Verde Islands was never known and a general allowance was made by Marinus which Ptolemy crystallized into an actual longitude thus perpetuating the fore-shortened west coast of Africa as is fully discussed in text Cp4. The latitude of the Cape Verde Islands given in Geographike Hyphegesis has been shown to be correct (as my previous texts illustrate) when the same scale maps are aligned at the Sacred Promontory. Thus it is possible to opine that an acceptance of the measure occurred from the information provided by Eratosthenes, his 2000 stadia extension, and Marinus reduced this to 1000 stadia. Therefore being a non evaluated distance it allows us to hypothesize on the actual positioning of the zero longitude. “Marinus the Tyrian, the latest of the geographers of our time, seems to us to have thrown himself with the utmost zeal into this matter. He is known to have found out many things that were not known before. He has searched diligently the works of almost all the historians who preceded him”. Thus Claudius Ptolemy commences his sixth chapter of Book 1, Geographike Hyphegesis. The most important geographical texts extant at that time would have been those of Eratosthenes of Cyrene and Strabo of Amaseia, who basically used the formers work to compose his Geography. Marinus uses precisely the same technique as Eratosthenes, that of itinerary measure stretched along one parallel, the 36th, to develop the overall length of the oikoumene. Marinus also continues the philosophy of Eratosthenes with his parallels and meridians. Unfortunately the text of Claudius Ptolemy is too vague in certain sections to allow a greater degree of accuracy concerning the Geography of Marinus the Tyrian. It does however allow us to indicate the knowledge that was continuously flowing across the world via the exploits of traders, and that the city of Alexandria was eager to gather in this knowledge via the Great Library. Thus the length of the oikoumene at 225 degrees is countered by the width from Thule at 63 N to Prasum given as 27800 south of the Equator, which totals some 118 degrees and is thus close to maintaining the 2: 1 ratio of length to width. That Marinus chose 500 stadia per degree is stated by Ptolemy, but, the length of the Stade is not mentioned. We should also note that Ptolemy in his Almagest used a stade measure of 700 per degree of latitude which reflects the Eratosthian measure. In chapter 13, Ptolemy indicates that the Eratosthian measure for India is being utilised, but that has been shown to be a measure based upon 157.5 metres and not the normal stade of c184 metres. Thus it is possible to opine that Marinus probably used distance measures as given and had no reason to question the length of the stade quoted. This is perhaps the saddest information it is possible to state. Had Marinus and Ptolemy but recreated the Eratosthian experiment we are informed of by Cleomedes then the actual number of stadia in a degree , no doubt the Attic Stadion, would have been resolved. The guestimate of the longitude from the Fortunate Isles to the Sacred Promontory, a rather convenient 1000 stadia, which just happens to be the next two measurements also given, has obviously led Ptolemy astray and kept researchers busy during the intervening period. But is this an early miscopy because of the same figures recurring. However, without the text and map of Marinus the Tyrian it is probable that we would not have the text of Claudius Ptolemy. And we should not forget that Ptolemy clearly states he is using the work of Marinus for his own Books, and thus perhaps we should celebrate this great geographical feat as being that of Marinus the Tyrian. The following text, Mt2, constructs the map of Marinus and discusses the culpability of Ptolemy. M J Ferrar December 2010. 1) Oxford Classical Dictionary, 3rd Edition, 2003. Oxford University Press. Claudius Ptolemy page 1273. 2) The Geography of Claudius Ptolemy, (trans) Stevenson, E.L. (1932). The New York Public Library. The text is a complete translation, with errors, and includes his measurement of the world. It is given as 180 000 stadia, but the length of the stadia is not quoted, neither is there a cross reference to it. A fourth edition digital copy is freely available on line from the National Library of Poland. 3)The STADION, GREEK or other. 5) Strabo, Geography. (trans. H L Jones.) Loeb Classical Library ,Harvard and London, 1917-1932. The text is also available on-line. 6) Ferrar, MJ, 2009, “Eratosthenes, Hipparchus and Strabo: Geographia. The length of the oikoumene measured on an aslant line. Texts Es1 and Es2. 7) Arnaud, Pascal. (1993), De la durée á la distance: l’évaluation des distances maritimes dans le monde gréco-romain. Histoire & Mesure Vol. 8 no 3, 225-247. Paris. Herodotus, The Histories, (trans), A. de Selincourt and revised by A.R. Burns, Penguin Books Ltd. In Book 4.34, Herodotus commences the section with the words, ’I cannot help laughing at the absurdity of all map-makers- there are plenty of them-‘, and proceeds to describe the known world. 8) Malleret, Louis, (1962,) L’Archeologie du delta du Mekong, Tome troisieme, La culture du Fu-Nan, chapitre XXV, OC-EO et Kattigara, pp421-54. Paris. (original now lost). It is recorded in two ancient texts, by Julius Honorius and Aethicus. 10)Pliny; “Natural History”, (trans. H. Rackham), Loeb Classical Library, Harvard and London, 1938. 11) Diller, Aubrey. (1948), “The ancient measurement of the Earth”, ISIS, volume XL pp 6-9.